Siding Spring observatory closure: Southern hemisphere loses early-warning system for meteors. Telescope dome at Siding Spring Observatory, New South Wales. The southern hemisphere’s only early warning system for meteors, asteroids, and comets approaching the planet has closed due to lack of funding. Based out of the Siding Spring observatory in central New South Wales, Australia, the survey was funded by NASA until it withdrew last year. Sadly, appeals to the Australian government and private donors to pick up the tab also went unanswered. Brad Tucker, an astronomer at the Australian National University, told Vice that we already have significant blind spots around the world for spotting such objects early. “There was a meteor explosion over Chelyabinsk, Russia, last year [that went unnoticed] … That was partially due to budget cuts at NASA, and specifically cuts to the Near Earth Object Program, which funds a lot of asteroid detection surveys. A lot of these surveys have been cut and it snuck through,” he said. Tucker noted that while it’s obviously easier to spot large asteroids that are kilometers in width, there are too few programs looking out for smaller comets and meteors of around 5 to 50 meters. These are sizes that might not be the end of us all, but are nevertheless dangerous. For instance, the Chelyabinsk meteor explosion injured more than 1,200 people across six Russian cities in 2013 after it detonated with the force of some 500,000 tons of TNT. Other scientists are also worried that we’re too fixated on asteroids the size of Texas—the type that might have interested Bruce Willis in Armageddon. Physicist Mark Boslough of Sandia National Laboratories in Albuquerque, New Mexico, has suggested that a small asteroid exploding in the air above a city poses a more immediate and likely threat than a “life-ending” asteroid actually hitting the earth. He called for a global survey and a new satellite to spot smaller asteroids. In an example of just how close these objects can come to planets in our solar system, on Oct. 19 the comet named for the Siding Spring observatory passed within approximately 87,000 miles of Mars. * Or, as NASA noted, a third of the distance between the Earth and its moon. 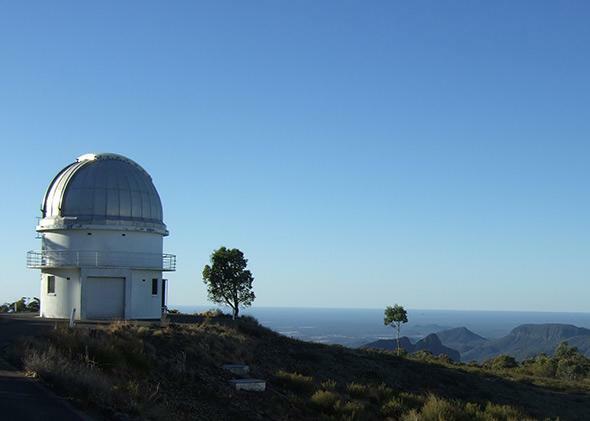 The loss of funding for the comet-spotting program is not the only threat the Siding Spring observatory is facing. The Guardian Australia also reported that light pollution from three proposed gas fields close by the observatory could render its many telescopes useless. The coal seam gas project, to be run by the mining firm Santos, is of concern to astronomers due to the strong light the mines are expected to emit at night. Peter Small, who works at the observatory, told the Guardian that light from a nearby mining operation already creates greater amounts of light than two neighboring towns. “If there’s light pollution from anywhere, never mind about the gasfields, this site becomes unviable,” he stated. As Slate has previously noted, the current conservative Australian government’s attitude to science is best deemed aggressively ambivalent. The country is without a science minister to advocate for programs like the Siding Spring survey, not to mention the millions in funding cuts to its peak scientific body, the CSIRO. There’s little more painfully representative of Australia’s present short sighted relationship with science than the idea that its enthusiasm for taking things out of the ground could literally outshine our ability to see worlds apart from our own and dangers beyond the next election cycle. Correction, Oct. 30, 2014: This post originally and incorrectly stated that the Siding Spring observatory was named after the Siding Spring comet. The comet was named for the observatory.